Three of the best locations on the Internet for finding and downloading new wallpaper images are Google Image Search, DeviantArt and 4Chan. Wallpapers are obviously only one of the many different kinds of images offered at those locations. It is however tedious to download images manually from those sites, as the process requires some time, considering that pages have to be loaded in the browser, and images selected for download. The free portable software Mediaspider has been designed as a bulk image downloader for those three locations on the Internet. 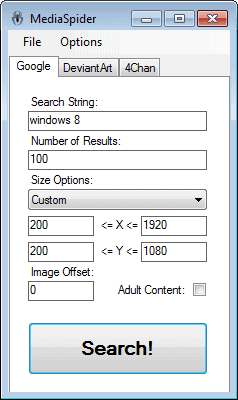 The program window separates the three sites into three tabs, so that users can configure the search and download parameters separately for each of them. These parameters differ slightly. Only a channel can be selected for 4Chan. The other two sites offer more parameters. This includes a search string, number of returned results, size options and option to skip the first x images. DeviantArt searches seem to require a registered account while the other two do not. Media Spider displays all images that it downloads in a preview window on the screen. This preview window has the same size as the images that are downloaded, but stays in the background all the time to avoid conflicts with other open windows the user is working with. Be aware that the downloader will download all images of a 4chan forum to the local system. The program lacks a few options, like an image size limit, proxy settings or a download limit for 4chan. 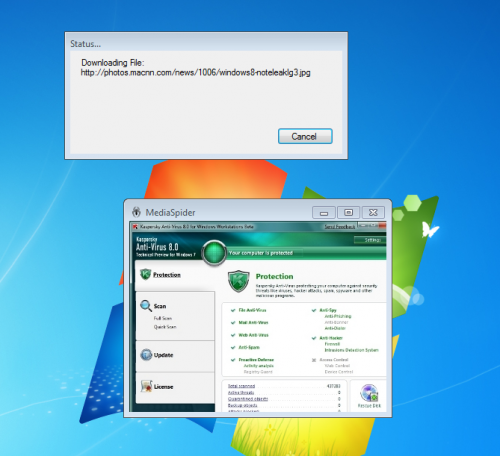 The program downloads hundreds of images from 4chan without interruption, as there are currently no options to limit downloads from the location. Still, MediaSpider does a good job at downloading images in bulk from Google, Deviantart and 4chan. Great for users who download lots of images from at least one of the supported websites, and hoarders. This is either an epic attack on 4chan’s servers, or an epic troll for everyone who uses it and downloads all the cancer and gore floating around there.